Our SEO Strategy Will Dominate Your Competition by getting you on Page 1 of Google. We work directly with our clients to determine goals, perform keyword research, analyze the competitive landscape, devise strategy for success, execute, monitor results and report analytics. Our SEO plans will increase your visibility and will give you the exposure that you need to dominate your competition. We have hundreds of #1 rankings for a long list of satisfied clients. If your business isn’t ranked at the top by the search engines, your competitors are grabbing business that could be yours. Do you know the search terms that people are using to locate the products or services that you provide? We do! Our search strategy experts will give you the required exposure online and increase your visibility. We rank our clients every day at the top of Google page 1 for top keywords as the leading Toronto SEO experts. 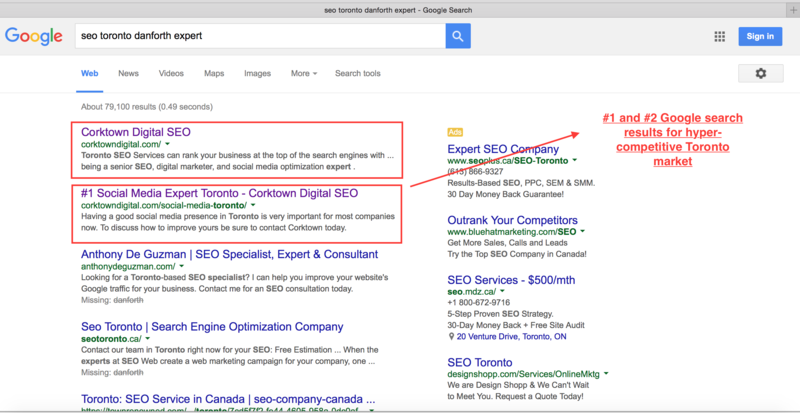 Corktown Digital ranks #1 for multiple SEO key words in a tough Toronto market and we will do this for your company as well. Corktown Digital will work with you will bring in more customers and better-qualified leads by optimizing the online channel and delivering top SEO results. Choose an SEO company that’s proven we can absolutely dominate the competition for our clients. Act now and get a head start for better rankings, increased online traffic and more customer leads. You’ll be happy you selected Corktown. Search engines rank websites based on a wide range of factors. Toronto SEO is a complicated process that structures a website so search engines like what they see. Our tested formula withstands the most demanding scrutiny of search engine algorithms. Corktown Toronto SEO Services include Local SEO, SEO Audits, SEO Competition Analysis, SEO Copywriting, Content Strategy, Infographic Design, Promotion, Link Profile Audit, Removal and Disavow Services, Social Media Services and Link Building Services. Just one bad-tempered former customer or, even worse, someone with a personal grudge, can blacken your good name throughout the Internet. If this should happen to you, we can ensure no one will ever be able to find those comments. Your customers will only find your owned and controlled listing in the SERPs. Our reputation management services include community management, blogging outreach, advocacy and campaign delivery on Google, Facebook, Twitter, LinkedIn, and YouTube. Web Design Toronto is about providing a great user experience of course, but the main focus of website design is getting you more customers. The website must function so the search engines give it a big stamp of approval. It is crucial the website is optimized on desktops, laptops, tablets and mobile phones. Prospects need to make the click that will convert them into customers. We will handle all of that for you. Getting your message in front of customers and prospects requires innovative social media strategies. Unlike most online marketing agencies, we utilize social media in the search engines. Leveraging social media with SEO will give you a commanding position. Our skill set includes social strategy, optimization, and measurement/analytics. Colin Tufts leads Corktown SEO. His expertise includes being a senior SEO, digital marketer, and social media optimization expert. His extensive eBusiness experience includes optimizing brands online and lead generation. His digital experience includes work for such powerhouses as TD Canada Trust, RBC, VISA, MasterCard, BMO, Mt. Sinai Hospital and Foundation, Jeep, Dodge, Chrysler, Sears, GE, Ocean Spray, Kelsey’s, Afinix Life Sciences, Belair Travel, Ontario Power Authority, Green Power Magazine, Sherwood Mortgages and the Liberal Party of Ontario. If you are ready to jump start your business and select Corktown as your online marketing partner, please contact us right away. We are ready to partner with you to propel your business to the next level.